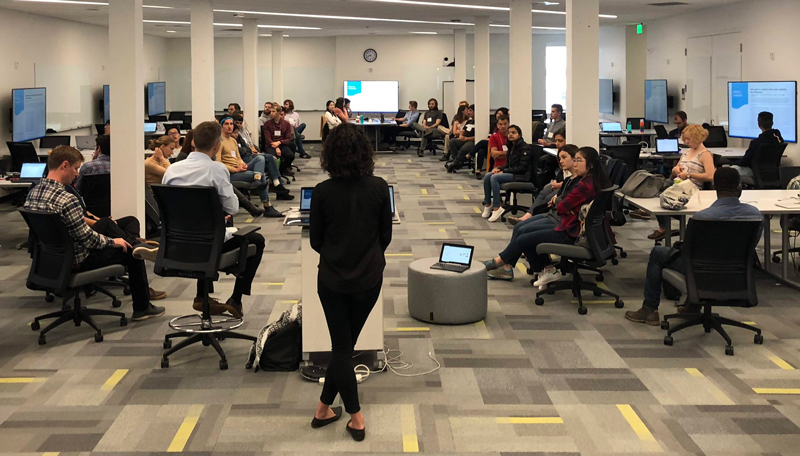 Workshops that fuse traditional learning with Silicon Valley–inspired “hack sessions” are giving scientists a new venue to build community and sharpen their skills. 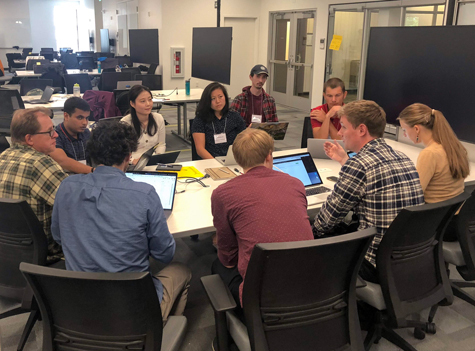 This week in Seattle, geoscientists from around the world are crowding in front of laptops in a classroom at the University of Washington to discuss code. The reason? It’s the 2018 Geohackweek, an interactive workshop focused on helping geoscientists push the boundaries of geospatial research by teaching them open-source software and data analysis tools. Inspired by hackathons typical of the tech world, hack weeks give researchers a venue to deep dive into data within a small group to see what they can discover. Geohackweek is the latest in a series of workshops run by a team of researchers that span a half dozen institutions, including the University of Washington, New York University, and the University of California, Berkeley. Inspired by hackathons typical of the tech world, Geohackweek and other similar efforts give researchers a venue to deep dive into data within a small group to see what they can discover. They seek to tease out clear answers to questions like these: Is there a way to layer or filter the data to learn something new about a given region? What signals can be found in the noise of different data sets? Scientists at the 2018 Geohackweek have been putting fingers to keyboard, seeking to isolate whether, say, environmental factors in cities can be linked to trends in mental health or lidar measurements of snow extent can clearly reflect global climate signals. Some are even pooling their creative energy to brainstorm creative ways to interactively display seismic data. In participating in such hacks, scientists are opening new avenues for collaborations, cutting through traditional academic pathways with targeted bursts of creative energy, explained Daniela Huppenkothen, associate director of the Data-Intensive Research in Astronomy and Cosmology Institute at the University of Washington and one of the organizers of the hack week workshops. “New experiments and instruments are very expensive,” Huppenkothen told Eos. “We have the responsibility to make the most of them and extract as much knowledge from them as we can, which is only possible with a good understanding of statistics and machine learning.” Hacks, she added, help scientists fulfill this responsibility. Geohackweek’s format combines structured learning opportunities, like tutorials, with open-ended group work sessions. In the mornings, attendees may sit and listen to experts speak about subjects like machine learning, coding geospatial data, or data visualization. In the afternoon, the “hacking” begins. Huppenkothen says that hacking is essentially any type of “free-form project work.” Although the term may conjure images of tech savants huddled in a basement, typing furiously while they search for ways to breach cybersecurity defenses, the term refers to exploratory software development conducted in a focused way. Researchers may come with an idea to work on, or they may lend their expertise to others’ projects. At one astronomy-themed hack week in 2015, said Huppenkothen, an astronomer and statistician teamed up to use an algorithm in a novel way to detect extrasolar planets. The project eventually led to a paper. Allison Bailey, a participant in the 2018 Geohackweek, brought her own project to the workshop, seeking to use lidar and aerial photography to map intertidal habitats along the Oregon coast. Bailey, who runs the geographic information system (GIS) consulting company Sound GIS, hoped to automate her mapping capabilities in Python using machine learning to speed up her workflow. This separation becomes a problem when scientists of any discipline must use methods for recording, storing, and analyzing data that are rapidly increasing in complexity, Huppenkothen explained. Yet formal academic curricula have been slow to adapt. To fill the gaps, nontraditional solutions, from unconferences to hackathons, have boomed. In particular, hacking, by its nature, seeks to break down barriers between disciplines, bringing together thinkers from diverse backgrounds to collaboratively wrap their minds around a single topic. Recognizing this, Huppenkothen and her colleagues began their first hack week in the summer of 2014. The group has since hosted 12 hack weeks on topics including astronomy, neuroscience, ocean science, and geoscience. After running half a dozen hack weeks, Huppenkothen and her colleagues wanted to hear what attendees thought of the workshop. So they conducted a survey, asking participants from six workshops to rate their experiences. The results were detailed in a study that published last month in the Proceedings of the National Academy of Sciences of the United States of America. More than 97% of those surveyed agreed that the workshop made them a better scientist. Of the 241 respondents, more than 95% agreed that they learned things that improved their day-to-day research. An even higher number, more than 97%, agreed that the workshop made them a better scientist. A little over 81% of respondents reported that they uploaded code or data that they created during hack week to GitHub or another public repository. More than two thirds of survey participants indicated that they taught others at the workshop, even if they were a more junior scientist in the group. The study noted “no indication” that scientists who were late career taught more than their greener peers. Hack Weeks: Here to Stay? The study cautions that the hack weeks are “continuously evolving” and that “our hack weeks are themselves experiments in how to help researchers learn data science techniques,” said Huppenkothen. “As we run these surveys over multiple years, we’re slowly building up an understanding, and can start combining the survey results with longer-term metrics such as citation counts and the longevity of software projects,” Huppenkothen said. In the end, Huppenkothen hopes that hack weeks become an additional resource for scientists to build the best tools possible. Citation: Duncombe, J. (2018), Hack weeks gaining ground in the Earth and space sciences, Eos, 99, https://doi.org/10.1029/2018EO106095. Published on 14 September 2018.